As likely to talk about Homer’s Springfield as Ithaca, Žižek offers a fascinating new take on Arendt’s open question. Embodying “the Heineken effect”, he refreshes the parts other thinkers cannot reach at a time when increasingly anaemic universities have begun to act as uncritical subsidiaries of their governmental and corporate sponsors. The motivation to write Žižek and the Media came from a desire to express exactly why he stands out so forcefully from the conventional commentariat as well as wanting to tackle head-on two frequently voiced objections to his work – the obscene humour and his refusal to provide ready-made solutions for the problems he so readily identifies. Both po-faced distaste and an instrumentally-minded yearning for immediate answers miss two fundamental points – his jokes are philosophically important and, despite the über-pragmatic nature of our times (or perhaps more so now than ever before), the over-riding purpose of philosophy remains the asking of questions rather than the providing of answers – as Heidegger put it: “questioning is the piety of thought”. In ancient Greece, the philosopher Diogenes (aka ‘the dog’) shocked the Athenian agora with public acts of defecation and masturbation. Although (so far) Žižek has limited himself to only talking about such acts, he can be viewed as a Diogenes for our online times. The following joke is not one that Žižek has used, but it nevertheless vividly encapsulates the paradoxically serious end of his frequently comic means. To apply this setting to today’s mediascape, the guest’s quip of ‘I wish I could do that’ is the socially acceptable level of communication that defuses otherwise disturbing situations – discourse’s equivalent of a lightning rod that channels away disruptive intrusions. By contrast, the hostess ups the traumatic ante. She extrapolates upon the guest’s interjection in order to undermine his attempt at defusing the situation. As a media theorist, Žižek provocatively mixes of the roles of the quick-thinking hostess and the pomposity-puncturing dog. In Žižek’s ideological analysis, the gypsy violinist illustrates a common aspect of today’s mediascape in which substantive questions about real problems are routinely desublimated into tacky entertainment. Žižek exposes the cynicism of a Western media system in which natural disasters like Haiti’s earthquake (the monkey’s testicles in the whisky glass) are transformed into the lachrymose sentimentality of a Simon Cowell-produced ‘Everybody Hurts’ (the gypsy song) by a music industry moonlighting as a philanthropic agency. Žižek encourages us to look awry at the media spectacle. In the case of Haiti, his parallax view helps us to reflect upon the decades of geo-political machinations that undermine poor countries’ basic infrastructures and thereby greatly (but predictably) exacerbate the human cost of disasters. Politicians meanwhile, like the gypsy singer, disingenuously re-frame human misery as implacable fate. Žižek continues the philosophical kynic tradition of exposing power’s pretensions by exposing the nether regions the powerful prefer not to think about. He acts out the Shakespearean role of Tray, Blanch, and Sweetheart, who barked their warning to King Lear that his authority was empty; he also shares with Brutus the sentiment that he would ‘rather be a dog, and bay the moon, / Than such a Roman’ (Julius Caesar, Act 4, Sc. iii). Mrs Merton’s comedy shtick was based upon fists of iron(y) hidden within velvet gloves of faux-naivete – a finely-tuned, tense marriage of form and content in which cruelly accurate insights flourished in what only appeared to be a non-threatening environment. Long influenced by the deceptively simple adage the medium is the message, Žižek and the Media focuses upon methods that, Mrs Merton-like, strategically combine form and content with subtle but highly effective results. Contemporary ideology works in a similar basic (albeit politically destructive) fashion. Seemingly inoffensive, banal media formats and pseudo-events disguise the true extent of the generally unacknowledged, but immensely harmful, underlying attitudes that those apparently uncontroversial media formats so efficiently service. More than any other theorist I am aware of, Žižek’s high theory/crude humour combination sheds light on these disavowed forms of media ideology. Examples of these forms include both asinine journalistic fixations (readers can count the number of times the phrase “special relationship” is repeated in news items whenever the US President and British Prime Minister have a scheduled meeting) and pathologically hypocritical blind spots and double standards (think of the profound difference in the concern shown by the US public for compensation payments in the wake of the recent Gulf of Mexico oil spill compared to the 1984 Bhopal disaster). The lowest common attitudinal denominator to contemporary ideology is our inability or unwillingness to take ethical responsibility for the deep damage to fellow human beings caused by the normal functioning of the capitalist system and its accompanying media. An incontinent urge to talk excessively about a “special relationship” may appear annoyingly unintelligent and predictable yet much of its truly harmful effect resides in the strength of the temptation to view such journalistic practices as essentially harmless journalistic quirks. Misguided tolerance overlooks the way in which journalistic fixations are merely a symptom of a much deeper disease – the media systematically displaces examination of real political issues through the use of feel-good bromides with profoundly negative consequences for millions of people around the world. Far from harmless, it is the very banality of “special relationship” type discourse that creates a powerful barrier to a series of pressing, more politically pertinent, questions. For example, the US-UK “special relationship” could be more productively reverse-engineered to interrogate the “special” way in which the British government turned a blind eye to the torture of British citizens abroad as part of the “War on Terror” (a declaration of war upon an abstract noun being decidedly “special”), the “special” nature of the UK’s entrance into an armed conflict based upon false information presented to Parliament, and so on. Although they are occasionally raised, politically radical questions, tend to sit awkwardly with the media’s standard operating procedure – a process of ethical and conceptual decaffeination designed to remove awkwardly substantive issues from close consideration. 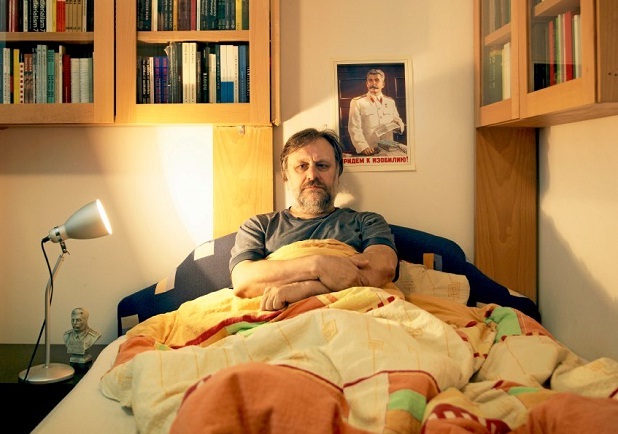 Žižek’s unlikely impact in recent years is ironically due to the stubbornness with which he stays loyal to two deeply unfashionable influences – Marxism and psychoanalysis. These approaches are profoundly out-of-favour at a time when they have never had so much diagnostic accuracy and Žižek’s popularity represents a return of this otherwise largely repressed truth that capitalist media discourse rejects the lost causes of psychoanalysis and critical thought whilst still skilfully incorporating some of their keenest insights into its everyday psychopathology. By contrast, Žižek and the Media explicitly addresses the miscellaneous forms of denial and repression used to avoid acknowledging a series of fundamental political contradictions at the heart of the capitalist project aided by such suggestive Zizekian concepts as the chocolate laxative. Based upon a product Žižek encountered in the US, the concept conveys the extent to which an element that causes a problem (chocolate-induced constipation) is frequently sold to us as the solution (the chocolate-flavoured laxative). Peristaltically accurate or not, the underlying idea can clearly be seen today in the form of the philanthropic initiatives of Bill Gates and George Soros. Also present in TV programmes like The Secret Millionaire, our admiration for the charitable acts of people whose charitable funds came from the very system that created the need for charity in the first place is tautologically cultivated. Žižek’s atypical appearance and sound (trademark hirsute dishevelment and a manically enthusiastic Eastern European accent-infused lisp) is perhaps what gains him entrance into a media realm into which intellectuals are only normally admitted if they are funny/larger-than-life (Stephen Fry, Žižek-the-Marx-Brother), or, in the mode of chocolate laxative media intellectuals like Alain de Botton and Simon Schama, if they flatter and massage our uncritical preconceptions in the guise of promoting deep thought. MT: You seem to come from a mainstream philosophical tradition (your Consolations of Philosophy has Socrates on unpopularity, Epicurus on lack of money, Seneca on frustrations, Montaigne on inadequacy etc. not, say, Baudrillard on modern life or Deleuze on watching films) whereas I find myself more drawn to so-called continental philsophy. Do you ever read ‘the continentals’? AB: “I am very drawn to so-called continental philosophy and my work makes frequent allusions to major figures in this tradition like Descartes, Kant, Hegel, Schopenhauer and Nietzsche. What I welcome in continental philosophy is the engagement with themes of everyday life and personal importance. The figures you mention, Baudrillard and Deleuze, aren’t people I like to write about, but I have read some of their works with pleasure. My real influence among the modern French thinkers is Roland Barthes. This is a clear statement in which contemporary continental philosophy is simultaneously acknowledged and dismissed from consideration. Mark Thwaite’s suggestion that more recent thinkers may have important things to say about today’s world is countered by de Botton with a redefinition of what is currently understood as continental philosophy so that the term comes to describe that thought from which we can be safely insulated by sufficient historical distance. The attitude de Botton exhibits here is in keeping with a media environment in which, to the extent that cultural theory is present at all, it is limited in broadsheet newspapers and periodicals to esoteric essays on relatively unthreatening historical and literary topics. Despite his alleged affinity for Nietzsche, de Botton is nevertheless part of a commentariat that is instrumental in the production of an eternal recurrence of decaffeinated thought. Few, if any, genuinely challenging or difficult philosophical ideas are presented by media intellectuals who prefer the sort of name-dropping in which philosophically-light bons mots are mined from suitably revered (if little understood) figures (e.g. Kant’s oft-cited saying that “Out of the crooked timber of humanity, no straight thing was ever made.”) The later continental philosophers Thwaite mentions are largely absent from the Anglophone media radar. In the UK, for example, Jean Baudrillard’s death met with limited recognition that included predictably lame observations that perhaps his death was a simulation that hadn’t really happened. Similarly, if mention is ever made of Jean Paul Sartre and Simone de Beauvoir it is most likely to appear as biographical details of their complicated love lives rather than any sustained engagement with their philosophical projects. Somewhat ironically given de Botton’s particular commendation of Roland Barthes who was committed to deconstructing the ideology of “what goes without saying” in everyday life, in his own life, it apparently goes without saying that a professional philosopher may read and enjoy challenging thinkers in private, but not feel obliged to explain why that enjoyment should not be shared with a philosophically-emaciated public – definitely not a fault of which one could accuse Slavoj Žižek. Žižek’s filthy provocations at least provide cerebral sustenance for whatever period of time we might remain incarcerated. Like Hamlet’s Marcellus, when the situation requires it, Žižek is prepared to counsel against resorting to an uncritical and violent acting out: ‘We do it wrong, being so majestical, / To offer it the show of violence; / For it is, as the air, invulnerable, / And our vain blows malicious mockery’ (Act I, Sc. i). More optimistically, Žižek’s scholarly analysis and media performances combine form (provocation) and content (abstract theory) in order to uncover the misleadingly obvious ways in which today’s media achieves its political effects. Ideology is at its most dangerous when it is experienced as cultural wallpaper. From Kung Fu Panda to Forrest Gump, and contra Arendt’s fears, Žižek does indeed manage to entertainingly illuminate the darker side of the superficially benign to show that whatever life’s secret ingredient really is … it is definitely not a box of chocolates. Paul Taylor is Senior Lecturer in Communications Theory at the University of Leeds. In addition to “Zizek and the Media”, he is the author of several books including “Critical Theories of Mass Media: Then and Now”. It´s beautifoull! Me<zanimalo vse kar sje napisal Slavoj, in mi zadostuje, tudi ce dugace mislim…Cestitamo! Very interesting article. I very much agree with the description of Zizek’s work and the role he plays in current intellectual life. I find the comparisons to Schama, De Botton, etc. very interesting. Especially De Botton’s comments on “European Philosophy”. I went through a 4 year course in philosophy at the University of Glasgow, and at no point did the syllabus mention any modern European philosopher. ‘Nietzsche’ was a dirty word, and it is no exaggeration to say that you could have completed the course and passed with flying colours and have absolutely no idea what had happened in philosophy since Hegel (with the exception of some of the work of John Rawls and American libertarians in some ethics courses). The only place any ‘continental’ philosophers (Barthes, Deluze, even Foucault) get a look in is in English and Film studies – similarly the only people I know who have read Walter Benjamin did so in Art School (on the age of mechanical reproduction). There is a willful ignorance amongst bourgeois intellectuals in this field which meets any mention of the last 100 years of philosophy in much the same way as the crowd at the dinner party meets the ‘if you give him a biscuit, you can’ comment. Its not even a rejection, its a total refusal to engage. Then he is no better than Mr De Button. I’ve suggested that there is no cerebral sustenance in Alain De Botton’s work – but there is in Zizek’s. De Botton routinely excludes whole swathes of Western Thought whilst Zizek doesn’t. So in that sense I’d argue Zizek is distinctly better than De Botton. 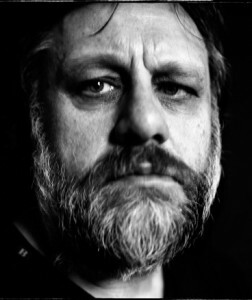 Zizek as Diogenes? I am not so sure. He doesn’t withdraw from the established order. He isn’t walking the streets in a loincloth. He is a great entertainer. Cerebral stand-up comedy at its best. The intellectual lives on as celebrity. Perhaps it can’t be otherwise at the moment.